Here are four options for you if you are considering having your money work for you. These options will help you by increasing your wealth potential. All of us are looking for methods that would allow to become us more financially secure. We look for ways that aren’t very risky but also those that would also promise high returns. Here are four options for you if you are considering having your money work for you. These options will help you by increasing your wealth potential. Futures trading is the contract to buy or sell an underlying asset at a specific date in the future and for a predetermined price. The buyer and seller are obligated to buy and sell the asset at the decided future date. In the future, there will certainly be a change in the price of the asset. In case the market price of the asset increases, the buyer earns a profit. On the other hand, if it decreases; the seller is benefited. Contrary to this, options trading does not force the buyer or seller to sell the asset at the predetermined date. However, it gives them a right to trade. Options trading requires the purchaser to pay a premium. If the contract gets canceled, the buyer will only lose the premium. Whereas, a thriving trade will either make the buyer or the seller rich. It is a Future and Options contract wherein the buyer and seller can exchange one currency for another at a particular price in the future. It is an excellent platform for importers and exporters as it gives them hedging opportunities. Even if there is a slight change in the currency rates, it will benefit either them enormously. Another advantage of currency derivatives is that it gives lucrative arbitrage opportunities. Arbitrage opportunities allow the trader to simultaneously buy and sell the currency in the inter-market to gain profits from small differences in price. 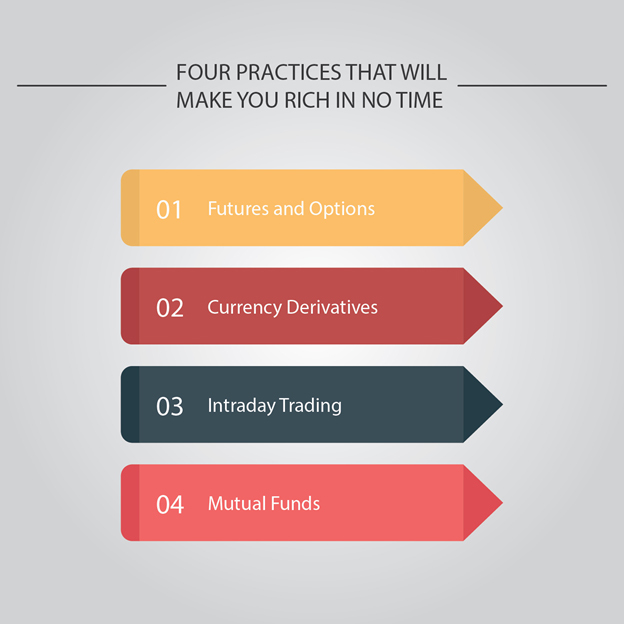 Intraday trading is another way to increase one’s wealth in a short period of time. As the name suggests, it is the buying and selling of stocks on the same day during the trading hours (9:30 to 15:30 in India). Intraday trading provides enormous profits if the right stocks are chosen. It is successful only if proper research is done on the stock market. Also, it is essential to follow the market trend to decide which stocks to buy. One must trade in liquid markets rather than volatile markets. Let us assume that after a proper market research, you buy 100 shares at the start of the day at ₹1000/share. At the end of the day its price increases to ₹1100. It will benefit the trader with ₹10,000. Hence, the combination of the above strategy will incur profits and make the trader richer. A smart way of trading is to invest in mutual funds. Mutual funds provide a lot of variety from debt-based to equity-based and mixed products. They have easy as well as complex structures, suited for every kind of investor. It also provides you an opportunity to invest in the funds of your own choice. Mutual funds have a tailor-made portfolio for their clients which help them make more profits in less time; eventually, making them rich.